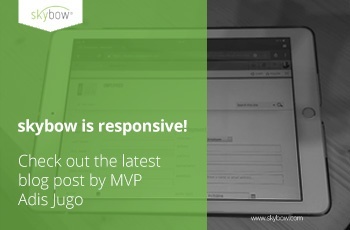 SharePoint-based business apps: high-performance, good looking and responsive? Sure! 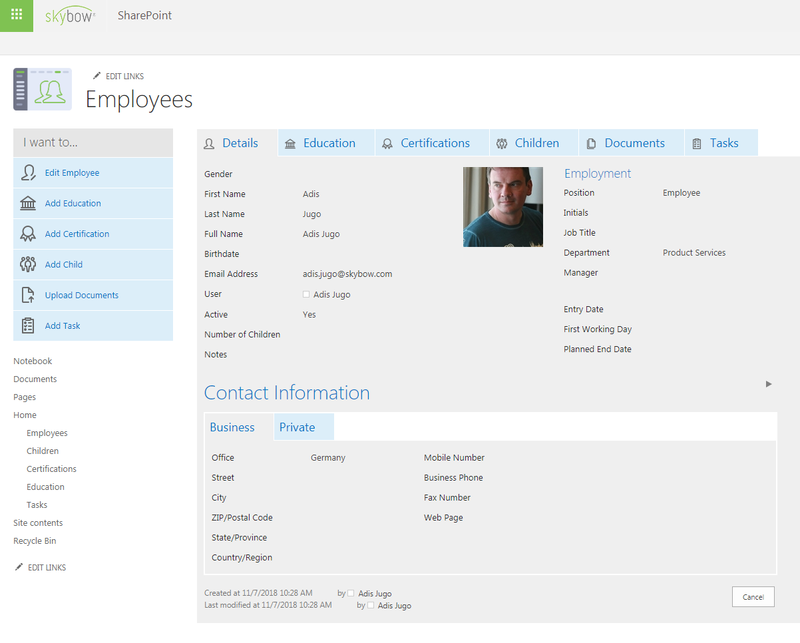 SharePoint-based business apps: high-performance, good looking and responsive? Sure!. One of the major requirements nowadays is that business apps are not only functional, but that they should look good, and be available on all different range of the form factors. They should enable users to perform complex tasks on desktop environments, but also perform some less complex, quick tasks, such as data entry and approval processes on the smaller form factors, such as tablets and smartphones. At the same time, SharePoint is the leading platform nowadays for business app development. SharePoint is today not yet fully mobile ready and responsive. But still, is it possible to build enterprise-ready, high-performance, good looking and mobile-ready apps for SharePoint? Sure. This is where skybow and BindTuning come into play. 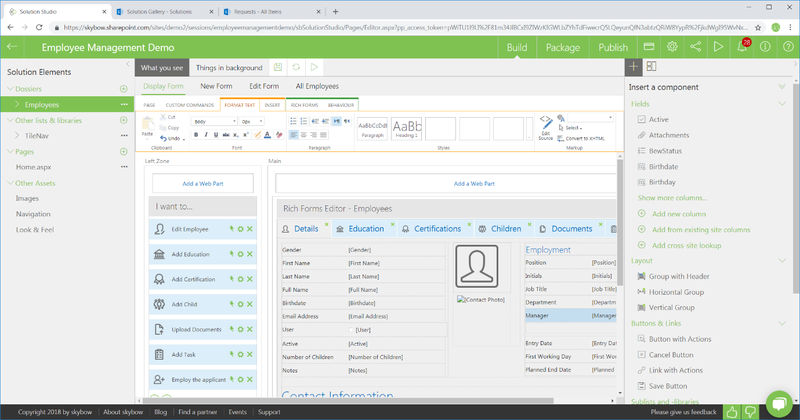 In the screenshot above, we can see an employee management app, which is one of the pre-created apps (templates) within skybow Solution Studio. It is an out-of-the-box, customizable template, which will let you manage some basic HR-tasks for your employees. When we start this app, we see that it is fully functional, but it looks pretty much like standard SharePoint. If we deploy this app to a classic team site, it will by default not be responsive, since classic team sites are not ready for mobile. That means that this app will be fully functional for the desktop users but might not look so well for tablet and smartphone users. And this is where BindTuning comes in place. BindTuning is the leading provider for branding SharePoint products. 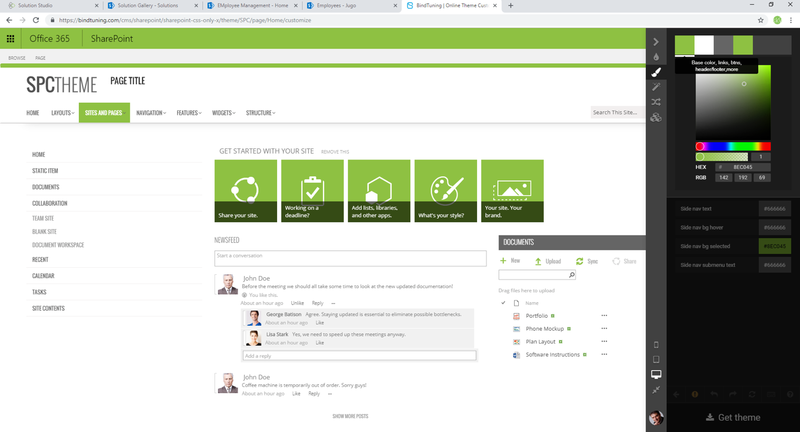 With the most feature-rich products in the industry, BindTuning gives you all the tools you need to transform any SharePoint site into an essential part for user’s day-to-day work. 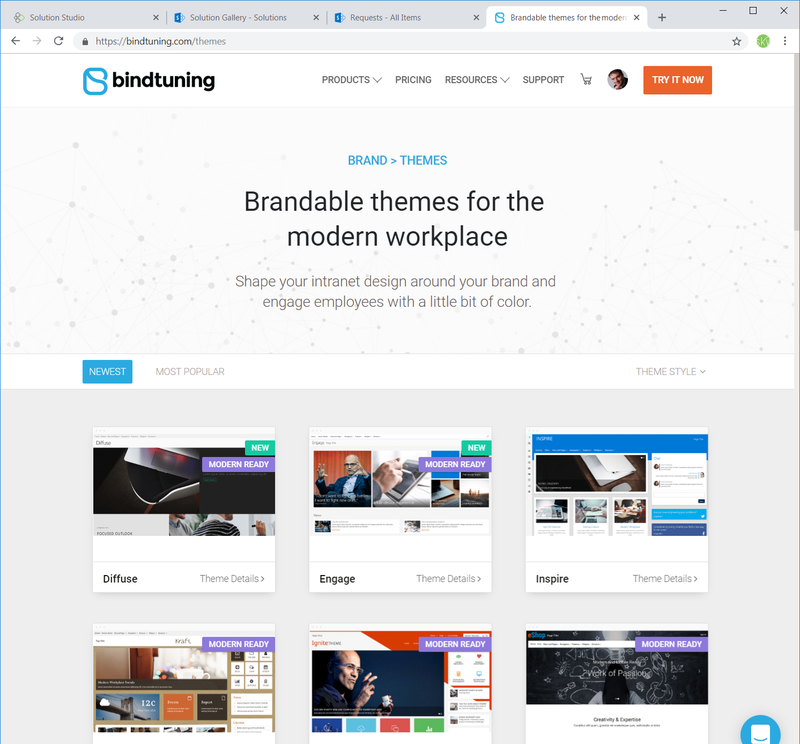 When you log into the BindTuning website, and select themes, you will see an entire gallery of available SharePoint themes which you can further customize. 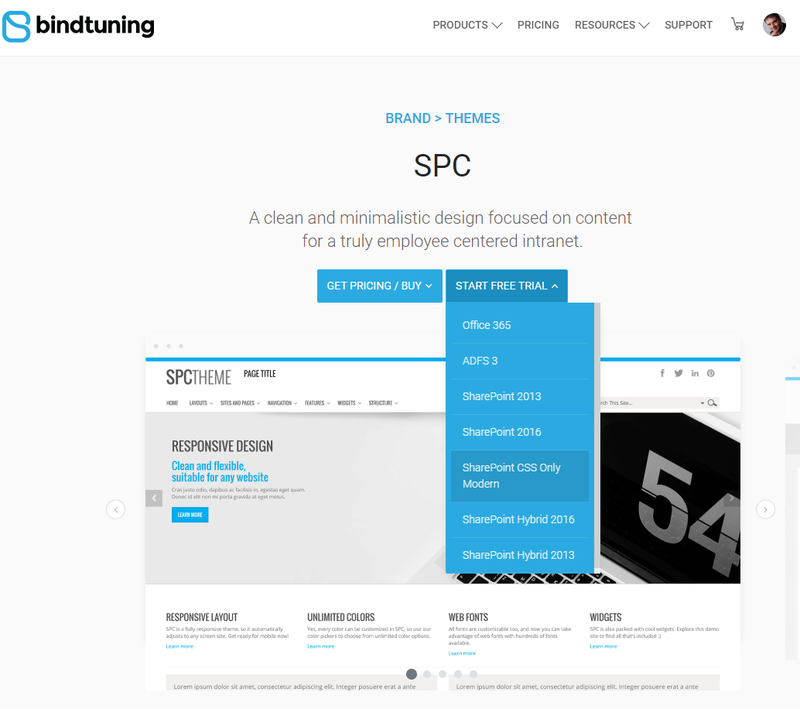 All BindTuning themes are responsive, mobile ready and support all versions of SharePoint and Office 365. I will here choose the SPC theme, inspired by the SharePoint Conference. I can download a free trial for 30 days, so I will download the SharePoint CSS-only version, which I can then apply anywhere. Once I start the trial, I have the option to customize this theme further. I will replace the default blue with the skybow green here. Defining custom colors is as easy as entering the URL of your choice and the same colors will automatically populate your theme. Customizing is very easy. You can change global colors and styles, or deep dive into any section in detail and change it. For the purpose of this article, I am okay here with simply changing the main color from blue to green. Once I am ready, I will choose “Get Theme”, decide if I want to download it as a SharePoint Framework package for the modern sites, or declarative sandbox solution for classic sites, and I am good to go. OK, this already looks good. 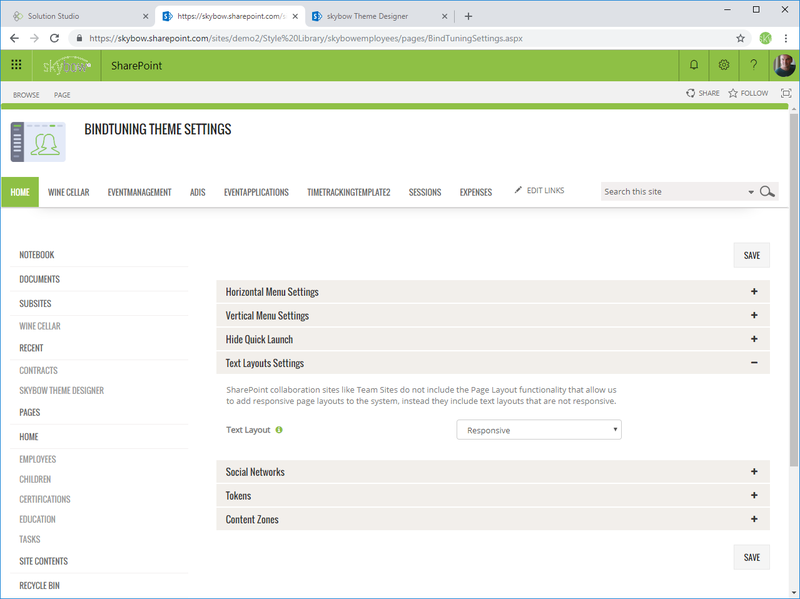 I will just shortly go into the “BindTuning Settings” menu option in the site settings menu, to fine-tune a few more things. I am going to change a few small things in the BindTuning settings in my business app. I will change the text layout to “Responsive”, and hide the Quick Launch menu, since I want to do the app navigation with skybow, and don’t want to confuse my users with “double navigation”. And that is basically that. 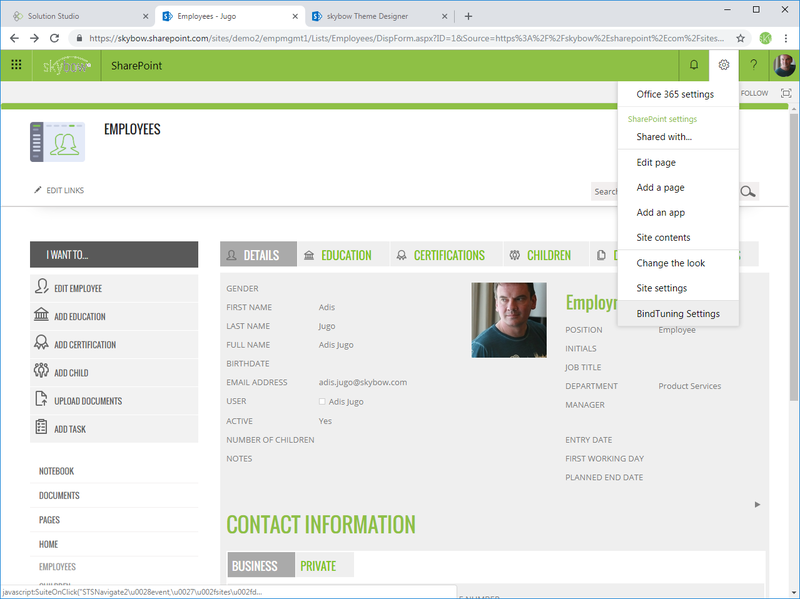 If I open my skybow employee management business app on my iPad, I will see that only the necessary parts of the app are shown (no menus, no other distractions) and that the app is properly resized to fit into a tablet screen. The responsiveness is even more noticeable in a smartphone layout, where only really the necessary info is shown, and all the forms are reformatted to be displayed in one column. 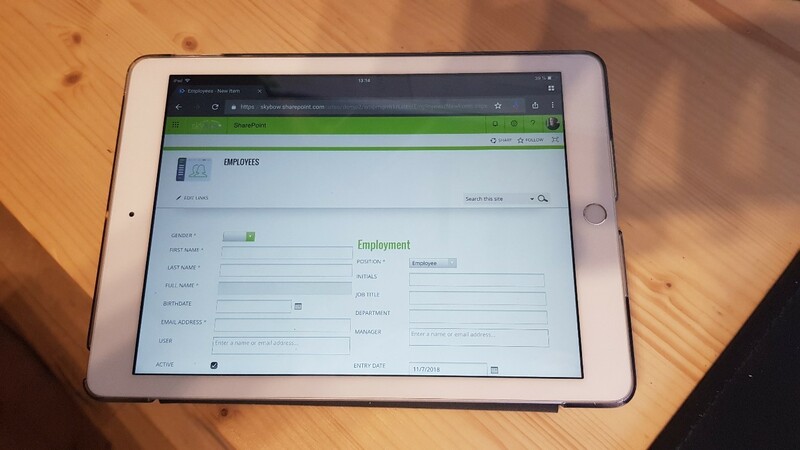 In the next screenshot, we can see the employee new form, for entering new employees, rendered on a Samsung Galaxy Note Android tablet with Google Chrome mobile browser. No scrollbars, no multiple columns, just a nice, clean single-column form for data entry. All that fully automated with skybow and BindTuning. As you can see, it is actually pretty easy to create word-class business apps on top of SharePoint. All you need there is some magic from skybow and BindTuning. Visit us at the European SharePoint Conference at booth #54 in Copenhagen, Denmark, on November 26-29 (skybow and BindTuning), or at the European Collaboration Summit, in Wiesbaden, Germany, on May 27-29 2019 (skybow), for a live demo.